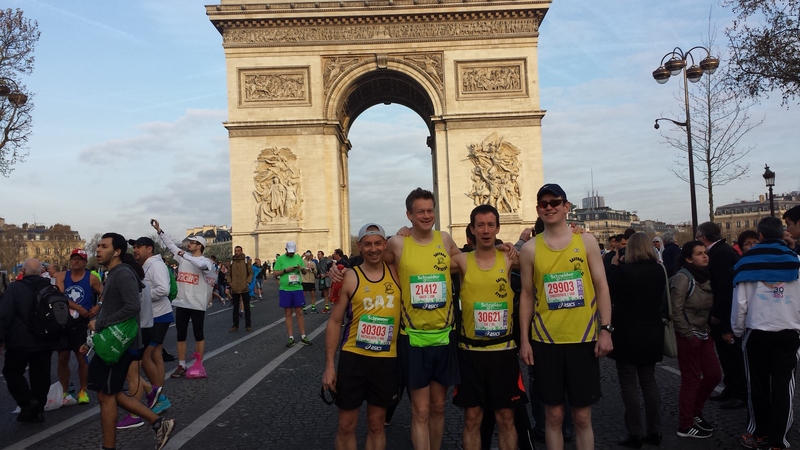 I headed toward the Paris marathon with some trepidation. Having had a lingering injury for some months I took November and December off to recover. 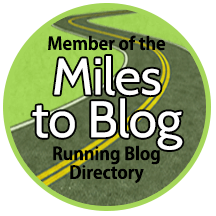 I started back running on January 8th and the left leg was feeling far better and started right back at the beginning running just a few easy miles and building up slowly. The trouble was I was 2 months behind most other people training for a spring marathon. All I could do was not panic about the situation but continue to slowly build the miles up week by week. In the weeks building up to the marathon I managed a 17.5 which was extremely difficult, a 20 miler which went really well and a 16.5 again where I struggled. I could do no more other than give what I had on the day. We departed for Paris on Friday 10th April so we had good time to explore Paris before the race. Leaving on the 13.31 from London we were in Paris at 16.50 and headed across town on the metro to the Arc De Triomphe which was a short way from our hotel, literally 3 minutes from the start and finish area (http://www.elysee-etoile-paris-hotel.com/) That Friday evening we headed for a walk about to get our bearings heading around the Arc De Triomphe along some side streets and down to the river with the Eiffel Tower standing on the opposite bank. 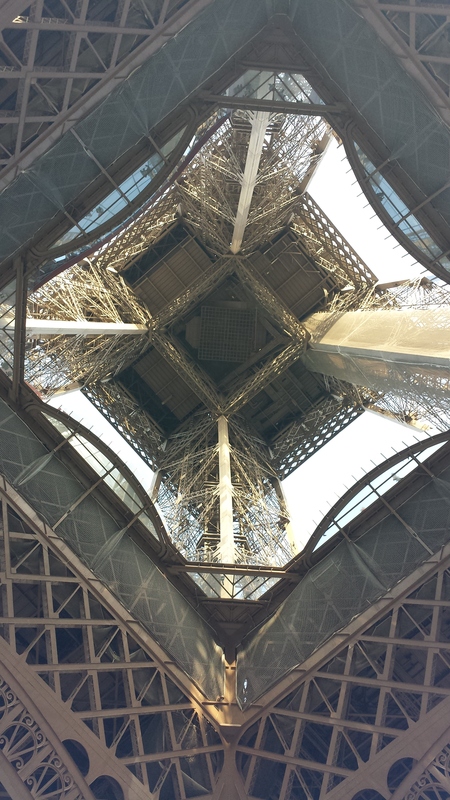 We then headed under the Eiffel Tower and along the park to a restaurant we had booked before leaving home. A fantastic seafood restaurant http://www.vin-et-maree.com/ which we can both highly recommend. The staff were very polite, friendly and understanding of our poor French! I was hoping to have a couple of early nights before the race which was looking to be impossible eventually getting to bed around midnight. On Saturday we made use of our Carnet of metro tickets to venture around town. First off on the Saturday I had to make my way to Port De Versailles and collect my race number and goodie bag. while there I bought some electrolyte powders to carry with me during the race in an attempt to stave off cramp. 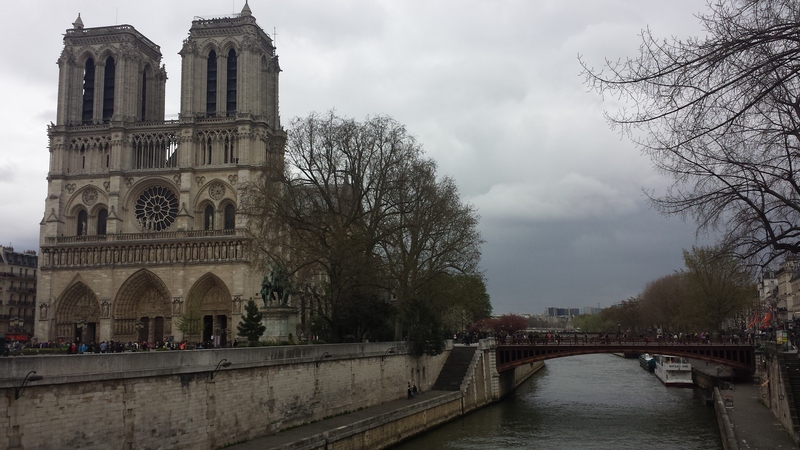 After finishing we headed across town on the metro again to Notre Dame. 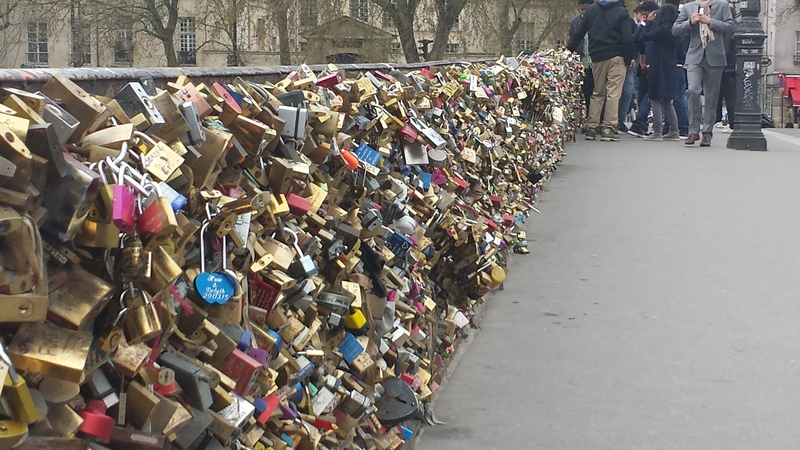 We looked around the Cathedral and the area shops and headed along to Pont de L’archdeveche and placed our own lock upon the bridge. After having some lunch we were running out of time. 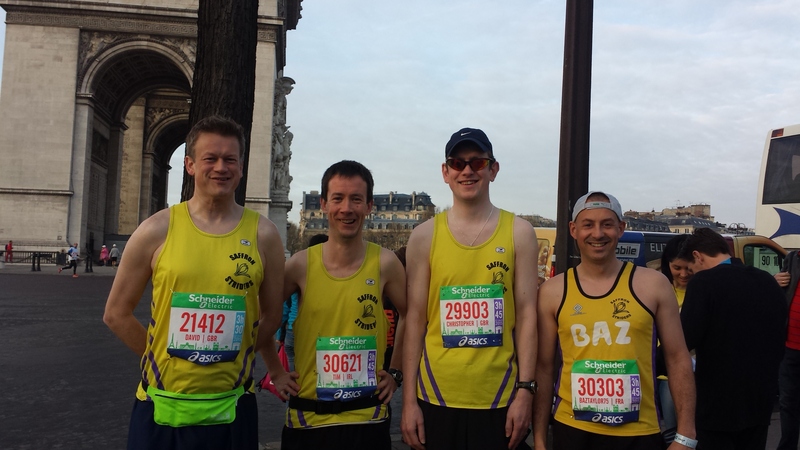 Three lads (Tim Mcmahon, David Johnson and Chris Bushell) from the my running club, Saffron Striders, were coming over on the Saturday and we had a restaurant booked for that evening so we had time to either go to Musee D’Orsay or head up the Eiffel Tower. before when visiting Paris we have been to the Louvre and the top half of the Eiffel Tower was in fog! 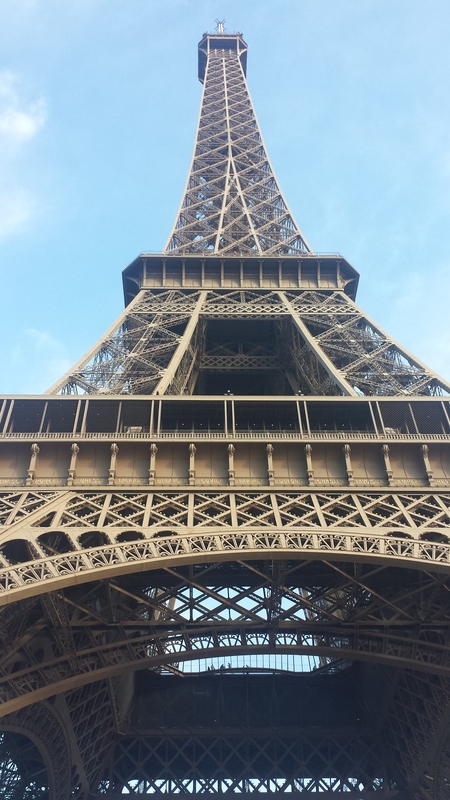 We decided to head over to the Eiffel Tower. Saturdays weather was overcast and a bit breezy and by time we got to the top it was blowing a gale and had started to rain a little, but we still had great views across the city and could see the entire course laid out before us. We had run out of time so headed back towards the hotel and met up with the others and soon after went out for our meal and had a reasonably early night. 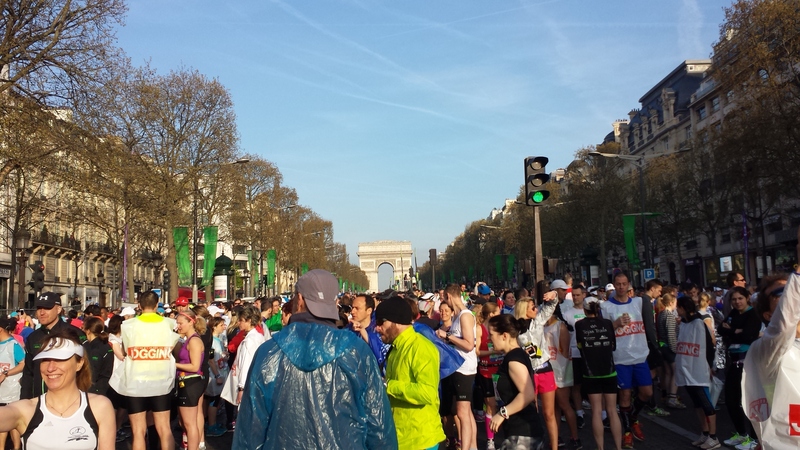 The morning of the Paris marathon had arrived. I had started to feel the nerves, the weather was warm already and the forecast was for a warm day of around 18c. I had a continental breakfast of coffee, croissant with jam and orange juice. We then headed out and had a photo close to our hotel. We were staying very close to the start and finish area so only had a couple of minutes walk. After talking about plans to meet up after the race we made our way down to our starting area. Having a current PB of 3h 59m for the marathon I was hoping I could improve a little and opted for the 3h 45m Violet start pen. The start pens started at 08.45am and headed out in 15 minute blocks, ours leaving at 09.15am. After a while of stretching and jogging around the cramped area we were moved down toward the start line and eventually away! I started out comfortably and always take the first 2 to 3 miles to get into a steady pace. The Champs Elysee is cobbled and didn’t know how much of the course was going to be like this. The weather was getting really warm and it was only around 09.45am, it was going to be hotter than forecast. I didn’t really take a great deal of notice of landmarks at the start, I do remember passing the Grand Palace and then Place De La Bastille. My pace was right on where I wanted to be to better my PB and was well on a 3h 45m marathon. As I started to warm up I knew I had to slow my pace a little I had my head down and was working away and before I knew it we were looping around the park at Bois De Vincennes. I was now down to 8m 30s per mile which was still on for bettering my PB. Next I was just looking for Notre Dame I knew this was well passed half way, cobbled sections kept appearing here and there and was uncomfortable on my lower legs. 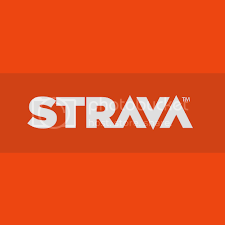 Around the Notre Dame area the roads dip down and go into subterranean tunnels which you then have to work up hill to get out of, these really affected my ankle that have had problems with and around mile 16/17 I felt my left Achilles ping and really began to burn and sting. There was no way I was going to drop out unless I was in danger of missing my train home. I took some Ibruprofen to help with the pain. I had been taking my electrolyte powders and so far had no issue with cramp at all. 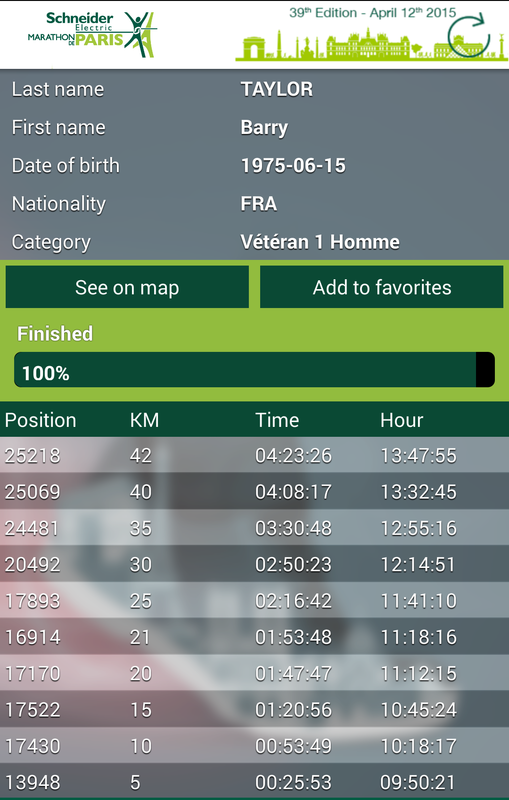 I was now passing the Eiffel Tower and had around 8 miles to go my pace had now begun to dip significantly and I was barely on for knocking a few minutes of my PB, as long as cramp didn’t hit I thought I may scrape a 3h 57m time. There is another park, Bois De Boulogne which you pass through before heading to the finish. I had just about entered the park after mile 20 and I felt my thighs tighten and the beginning signs of cramp coming on. I knew then that it was going to be a tough 6 miles back to the finish. There had only been water on the course and I could have done with some energy drink as well. I had to walk I knew if I cramped fully I would be stopped for minutes trying to stretch and relax so it was better to walk and let the legs relax a little. I can’t remember where it was but there was 1 Isostar stand with energy drink so I had 2 cups which helped and picked me up so I could jog along again. The heat had been burning on my back for over 13 miles and I was starting to feel sick, I had been drinking plenty and wetting my head so although it was bit of a late thought I turned my cap around to protect my neck. I was so close now and counting down the kilometeres…38…39…40. 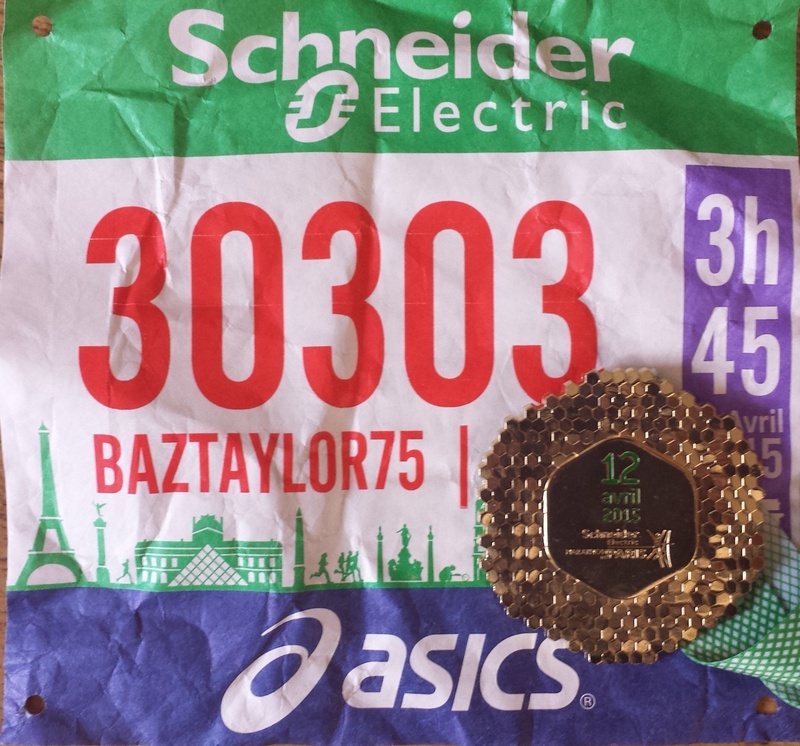 I knew my PB had well and truly slipped away but I was running the last mile of the Paris marathon, in pain, but with fantastic weather and great crowds. With a last surge I passed as many people as I could manage without cramping up and finished. Initially I made it about 4h 25m, 26 minutes outside my PB. All things considered it was a great experience, I was disappointed that I didn’t do better but I was at least 4 weeks behind on training and I’m not really good at running in hot conditions so that was more than a fair time on the day. Now I know what to expect, how to travel around and have a good hotel to use I would think about signing up for next year. I have nothing else booked at all for this year so I’ll have a couple of days to get passed the worst of the soreness and pick the running up again later this week.